R. K. Narayan, full name Rasipuram Krishnaswami Iyer Narayanaswami, was an Indian writer, novelist and short story writer, best known for his works like Swami and Friends, Malgudi Days, The Guide, and The English Teacher. 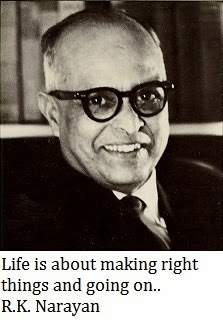 Here I have compiled some of the famous R. K. Narayan quotes for your mental digest. Death and its associates, after the initial shock, produce callousness. Life is about making right things and going on..
No one ever accepts criticism so cheerfully. Neither the man who utters it nor the man who invites it really means it. The difference between a simpleton and an intelligent man, according to the man who is convinced that he is of the latter category, is that the former wholeheartedly accepts all things that he sees and hears while the latter never admits anything except after a most searching scrutiny. He imagines his intelligence to be a sieve of closely woven mesh through which nothing but the finest can pass. The faint aroma of gum and calico that hangs about a library is as the fragrance of incense to me. I think the most beautiful sight is the gilt-edged backs of a row of books on a shelf. The alley between two well-stocked shelves in a hall fills me with the same delight as passing through a silent avenue of trees. The colour of a binding-cloth and its smooth texture gives me the same pleasure as touching a flower on its stalk. A good library hall has an atmosphere which elates. I have seen one or two University Libraries that have the same atmosphere as a chapel, with large windows, great trees outside, and glass doors sliding on noiseless hinges. The sun set beyond the sea, so says the poet - and when a poet mentions a sea, we have to accept it; no harm in letting a poet describe his vision, no need to question his geography. We always question the bonafides of the man who tells us unpleasant facts.